The Dalai Lama on Thursday declared that he is still a Marxist in spirit who condemns capitalism as a system whose main goal is "how to make profit." Marxism has "the only economy system expressing concern of equal distribution (of wealth); that is moral ethics,'' the Tibetan Buddhist leader told a news conference at the start of a four-day New York visit. The 74-year-old Nobel Peace Prize winner spoke minutes before his afternoon teaching session at Radio City Music Hall on the stage that hosts the dancing Rockettes every Christmas. Tickets for each of six such sessions -- two a day starting Thursday morning -- sold for $20 to $60 apiece. But several Internet sites were reselling them at prices nearing $700. Asked what he thought about people having to pay to hear his spiritual lectures, he said: "This is up to organizer. I have no connection." He then said that he always asks organizers of his worldwide appearances that any tickets be "cheap" and that he personally never accepts payment. In addition, some of the proceeds from the events go to hunger relief and other charities, he said. He said some friends tell him not to mention that "still, I am Marxist'' _ because he believes the goal of many Western democracies is "only how to make profit,'' creating economic inequalities that contribute to social ills. Thousands of Tibetans rose up against Chinese rule in 1959, and the Dalai Lama was forced to escape to India with his followers. He's now the political leader of Tibet's exiled government. 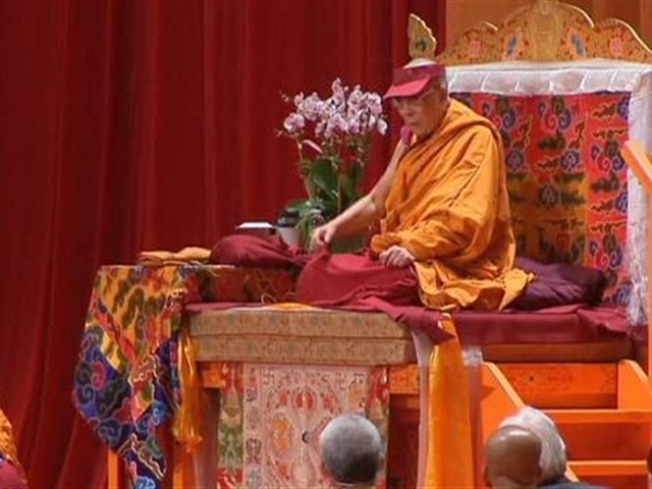 On Thursday afternoon at Radio City Music Hall, the Dalai Lama planned to speak about the philosophical concept of emptiness and the way to enlightenment. Four more teaching sessions were planned for Friday and Saturday. On Sunday at the Cathedral of St. John the Divine, the Dalai Lama was to participate in an interfaith discussion titled "Kinship and its Meaning in Our World Today." "Islam was also created by God," he said, letting out a giggle when several reporters appeared surprised. He came to appreciate Muslims during his 50 years living in India, he said. And now, when "the terrorists come from Pakistan," most Muslims still deserve respect. As he left the site of the briefing, in a basement room of the hall, a beaming Dalai Lama assured reporters that despite his view of capitalism, he enjoys being in the world's financial capital.